CORGIdirect support professional tradesman providing easy ways to buy essential products, to help tradesmen to work safely and competently. CORGIdirect have supported the Gas Safe Register since the change in registration body, offering Gas Safe licensed forms and labels, along with professional tools and work wear. Corgi publish a wide range of technical manuals for both the gas and electrical trades, these paper publications spend a considerable time in the harsh environment of the tradesman's tool box or van and are therefore prone to damage and moisture. We were asked to design and manufacture of a range of hardwearing, water resistant cases to hold and protect the manuals. We have produced a number of sizes and formats for the past 5 years for CORGI, utilising screen printing on to polypropylene which is then cut to shape, made up without need for glue and fastened with a clip lock solution. 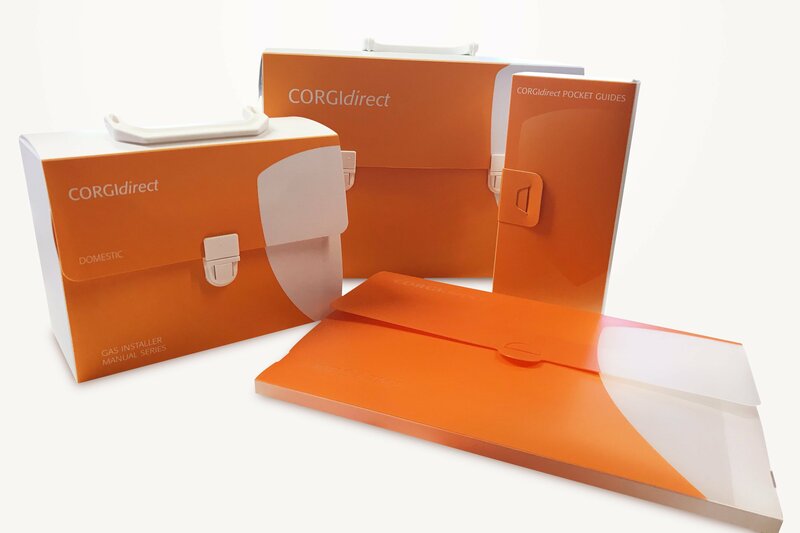 The cases feature in the CORGIdirect product range.